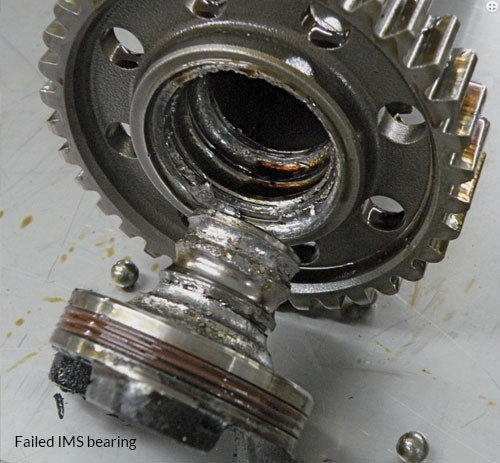 Intermediate shaft bearing (IMS) failure! Is this a genuine concern or a worry over a few isolated incidents? If you were to ask a 996 owner who’s had one fail with catastrophic consequence, then I’m sure they would say it’s a real concern however, for everyone that has seen a problem, there must be thousands who would say they’ve had nothing but joy from their Porsche with no issues whatsoever. What is an intermediate shaft and why are they used? Porsche have been using an intermediate shaft in their 911 engines since day one, the purpose of the intermediate shaft is to indirectly transmit drive from the crankshaft to the camshafts on both sides of the engine. 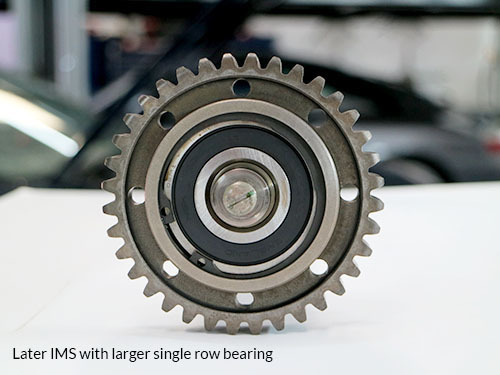 By using an intermediate shaft, Porsche were able to control chain travel speed through the use of differing gear sizes, which would in theory increase the service life of the timing chain. The original intermediate shaft used in the air cooled 911 models was a short shaft positioned towards the front of the engine and ran on solid bearing shells like those used for the crankshaft and conrods. Whereas the IMS used in the water-cooled models uses a much longer shaft, with the front end of the shaft using a plain bearing surface integrated within the oil pump housing, which is pressure fed oil for lubrication directly from the pump, these are not prone to any issue. Due to the design of the engine and crankcase, it was not possible to use this type of bearing at the rear of the shaft and Porsche used a sealed ball-bearing, this is where the problem occurs. The bearings used were a sealed race bearing, pre-packed with grease for lubrication (more commonly used as an external bearing) some reports may indicate this seal restricts oil flow to the bearing, others point more towards inadequate load capabilities of the bearings used as the main cause of failure. All water cooled 911’s Boxster’s and Caymans from 1997 through to 2008 are at risk of suffering an IMS bearing failure, with the exception of the Turbo, GT2 and GT3 models which maintained use of the air-cooled style shaft. Through production of these models Porsche have changed the bearing type several times, initially using a dual row bearing from 1997 – 2000 (with minimal failing) before moving onto a single row bearing between 2001 – 2005 (reports indicate this single row bearing as being the most liable to failure). The later 997 and 987 Boxster and Caymans used a larger single row bearing with greater load capabilities that proved to be a lot more reliable. Unfortunately, from a customer’s point of view early warning signs of a failure are hard to spot, you may notice an oil leak from the rear of the engine? There are several other things this could be and is probably more likely to be, however it is worth having any oil leak from this area checked out by your local Porsche specialist to rule out any potential IMS bearing issue. For the experienced ear there may be a slight bearing rumble or vibration noted towards the later stages of failure but unfortunately this is probably too late and the inevitable failure is sure to follow and soon to be followed by a pronounced rattle and probable engine failure. Really the only successful pre-failure detection is through regular oil changes along with oil filter examinations, during which we would be looking for any black rubber particles from the seal around the bearing or small metal filings that would almost certainly have come from the bearing itself? We would also recommend the fitment of a magnetic sump plug as part of your next oil change, this could help detain any metal fragments that have not been captured within the oil filter itself. The extended 2-year service intervals of the later Porsche’s can restrict the early detection of any internal engine issues through oil contamination and we would recommend changing your engine oil and filter on a more frequent basis. The earlier M96 engine used a bearing that is extractable for replacement without engine disassembly whereas the later M97 engine uses an increased diameter bearing the only method for replacement is by means of complete engine disassembly. 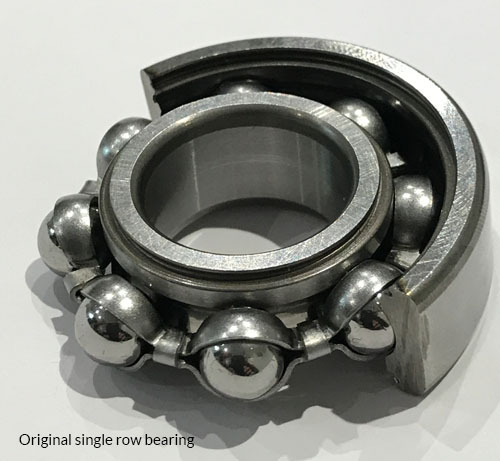 There are various bearings available from a range of manufacturers, however one of the first and most recognised companies to manufacture a viable solution for the IMS bearing is LN engineering. 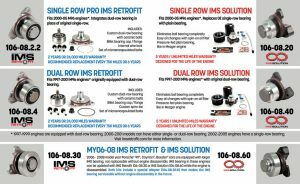 They Provide an option for single and dual row bearing replacement and use an open hybrid ceramic bearing with a low oil dependency of only 1cc per minute which is easily achievable within a wet sump without the need for a direct feed. LN engineering have continued their development work and now offer an IMS solution which completely eliminates the use of a ball bearing replacing it with a pressure fed oil lubricated plain bearing similar in function to the one at the front of the IMS. 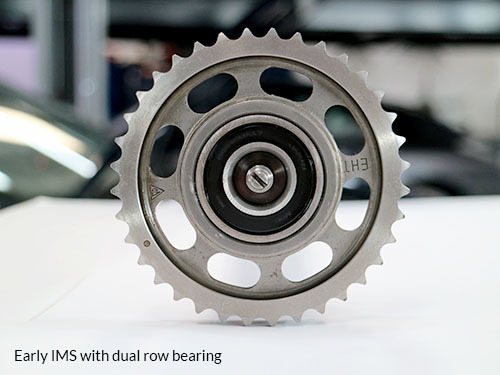 For further information on IMS bearings or to arrange an appointment to have yours replaced please contact our service department on 01423 865602.